Salt Water New England: From a Reader: What is the State of the Word "Preppy"? From a Reader: What is the State of the Word "Preppy"? In 2018, what is the state of the word "preppy?" How do other SWNE readers currently react to the term? What are milestones in the term's history? Does the term have value or even meaning today, should it go fallow for another decade or two (or three), or should it just disappear all together? Is there another word for the original ideas, pre-1980? The meaning is, and always will be the same. Websters: A student at, or a graduate of, a prepatory school. A person deemed to dress, or behave, like a preppy. Scholarly pursuits, honor, respect, integrity, truth, and character come to mind... There has always been a strong connection with the British boarding school ethos. Milestones that changed prepdom which come to mind: Two world wars that took out a good portion of the social classes that attended day and boarding prep schools on both sides of the Atlantic. The appeal to honor had them being among the first to enlist. Later, great advancements in medicine meant U.S. and British expats no longer had to send their children home to boarding school to escape disease and death. By the late 60s and into the 70s the introduction of counter culture/hippie drugs to these campuses changed prepdom drastically. My headmaster, in particular, was old school and was blind sided. By the time I got there in the 80s I believe he had given up. 1980 saw a change over from the hippie drugs to what would be considered club drugs now. I never partook because I had seen it ravage extended family members. No judgement on those that did partake. It just scared the hell out of me. Financially, by the mid 80s, British boarding schools lost their state subsidy, and if they did not have old school endowments, they were left in the lurch. Particularly girls schools which did not have the established old boys networks giving back to their alma maters. Here in the States the insane and horrendous competition for premier facilities and golden handcuffs at prep schools began. Social club memberships by and large were no longer a write off, and businesses stopped paying for them for their employees. So parents had to pony up themselves. Education for little Johnny, or club memberships? The costs on both sides of the Atlantic for these educations have risen exponentially cutting out a huge portion of the professional, middle, and upper middle classes. What does that leave? The uber wealthy and smart scholarship children... along with the irony that we based our prep schools on the British, who have in turn had to base their survival on our rubric of alumni development and relations. I boarded in New England and just outside of London. You can just insert Preppy for Sloane in most of what he says and it rings true over here as well. Interesting point he made about aspirational times after the 70s. The US is based on, and has always welcomed optimistic, upward mobility. Thatcher broke the mold in a landed, class rigid society. Difference is now that upward mobility which came with the flood of new, big money on both sides of the Atlantic no longer comes with the aspiration to behave the way the people did who originally wore the clothing etc. Namely the breeding of seasoned money, codes of conduct/dress, and "things understood" worked out by generations having lived through very difficult times. That whole process distilled to an appreciation for wit, and to "common courtesy". Vulgarity rules now. There is no such thing as bad press. Go to a decent restaurant and see how people eat and behave. Don't even mention travel. The list goes on. Just in this thread you can see what a good job retailers have done in the last almost 40 years separating preppy attire and leaving behavior aside. When people think of preppy the majority, right or wrong, identify with and think of items, not behavior. In this blog, look at the number of aspirational comments regarding items of dress. Then look at the number of comments of the posts which represent the backbone. Slice it how you want like a Starbucks order regarding the term Preppy; the appeal of wit and common courtesy is still here, and it will prevail. Thank you for the photos. What a cute wee dog in that basket. Sometimes people call my manner of dress "Prep" or "Preppy." I don't correct them, but neither do I think that I conform to any type. I dress classic and slightly boring. For me "Preppy" was a bold variation on classic style; bright colors sometimes paired for their contrasts; Lacoste, Reds, Weejuns, Patch Madras, and always Blazers. It has been corrupted since by RL Rugby and others, but I suppose the post-50 crowd remembers. Dress bold, confidently, and high quality, and let them call it what they will. I for one will never give up my vintage Lacoste polos. The meaning is, and always will be the same. Websters: A student at, or a graduate of, a prepatory school. A person deemed to dress, or behave, like a preppy. Scholarly pursuits, honor, respect, integrity, truth, and character come to mind. In short, educating and rounding the entire child for college is the end goal with one-stop-shopping on bucolic campuses. There has always been a strong connection with the British boarding school ethos. Milestones that changed prepdom which come to mind: Two world wars that took out a good portion of the social classes that attended day and boarding prep schools on both sides of the Atlantic. The appeal to honor had them being among the first to enlist. Later, great advancements in medicine meant U.S. and British expats no longer had to send their children home to boarding school to escape disease and death. By the late 60s and into the 70s the introduction of counter culture/hippie drugs to these campuses changed prepdom drastically. My headmaster, in particular, was old school and was blind sided. By the time I got there in the 80s I believe he had given up. 1980 saw a change over from the hippie drugs to what would be considered club drugs now. I never partook because I had seen it ravage extended family members. No judgement on those that did partake. It just scared the hell out of me. Financially, by the mid 80s, British boarding schools lost their state subsidy, and if they did not have old school endowments, they were left in the lurch. Particularly girls schools which did not have the established old boys networks giving back to their alma maters. Here in the States the insane and horrendous competition for premier facilities and golden handcuffs at prep schools began. Social club memberships by and large were no longer a write off, and businesses stopped paying for them for their employees. So parents had to pony up themselves. Education for little Johnny, or club memberships? The costs on both sides of the Atlantic for these educations have risen exponentially cutting out a huge portion of the professional, middle, and upper middle classes. What does that leave? The uber wealthy and smart scholarship children... along with the irony that we based our prep schools on the British, who have in turn had to base their survival on our rubric of alumni development and relations. In the decade of Reagan and Thatcher that followed, EVERYTHING was for sale, and it still is. I was a scholarship kid at a NYC prep school in the late 70s and early to mid 1980s. Your assessment is spot on. The conservative and timeless style of dress popular in the 80s among many of my classmates. I haven't spent much time thinking about the definition of preppy but, while I live in the US now, I went to school in the UK, so part of me associates preppy with old England. When it comes to clothes, I think of preppy as basic - dare I say "plain" - traditional and classic pieces that can be worn in the country as well as in town forever. Not trendy! Thanks for the links and interesting reads. I boarded in New England and just outside of London. You can just insert Preppy for Sloane in most of what he says and it rings true over here as well. Interesting point he made about aspirational times after the 70s. The US is based on, and has always welcomed optimistic, upward mobility. Thatcher broke the mold in a landed, class rigid society. Difference is now that upward mobility which came with the flood of new, big money on both sides of the Atlantic no longer comes with the aspiration to behave the way the people did who originally wore the clothing etc. Namely the breeding of seasoned money, codes of conduct/dress, and "things understood" worked out by generations having lived through very difficult times. That whole process distilled to an appreciation for wit, and to "common courtesy". Vulgarity rules now. There is no such thing as bad press. Go to a decent restaurant and see how people eat and behave. Don't even mention travel. The list goes on. Just in this thread you can see what a good job retailers have done in the last almost 40 years separating preppy attire and leaving behavior aside. When people think of preppy the majority, right or wrong, identify with and think of items, not behavior. In this blog, look at the number of aspirational comments regarding items of dress. Then look at the number of comments of the posts which represent the backbone. Slice it how you want like a Starbucks order regarding the term Preppy; the appeal of wit and common courtesy is still here, and it will prevail. @11:24 AM I have never used "preppy" to refer to the content of one's character, nor will I ever. Associating preppy with a style that lacks substance beyond high quality classic clothing and the like shouldn't be confused with being "aspirational." I'm sure you witnessed, as have I, vulgarities and lack of wit demonstrated by the "preppies" during your school days. @11:24 AM: Can't improve on this. Excellent analysis. Averyl and Sartre did you even read the articles? My response was to the recommended reading by MD&E in England, not your comment Averyl. I said behavior, not content of character. I didn't agree with your comment the other day Sartre, but it is your opinion and just that, which I respect. Common courtesy. Open a new tab and write your view. I will respect it, consider it, and quite possibly learn something new. @4:26 PM No; I did not realize it was required reading for this test. ;) I think I need to stop multitasking and commenting here at the same time. If I have time I'll read the links. Thank you for clarifying and please excuse my assumption that you were responding to me. I don’t know what in the world you mean about common courtesy, opening a new tab and writing my view, etc. I suppose in my world "preppy" ended when a dismissed former chaplain of my school was put on the FBI's Ten Most Wanted list for fire-bombing a university ROTC building. Now those same folks seem to be in charge of education in most of the country. My most recent foray into a school alumni event was filled with politically correct speeches about how the school is addressing all sorts of bad "isms" in the interest of the greater good. Portions of the history of the school and its alumni had been totally rewritten to fit the new ideology. I decided then that I had become too much of a fossil and that would be the last time I would attend a school function. The word was popularized by Hollywood to signify someone who has gone to and attained education at a preparatory school. It was extrapolated to a lifestyle, a wardrobe, a race with strong ties to certain parts of the country, namely New England. My children attend preparatory schools, but they don't subscribe to the geographical, sartorial & demographic portrayal - and this seems to apply to the student body of private educational institutions that I visited as a parent and as a commencement guest. I think the term has faded to black. The term 'preppy' has become so commercialized that it has come to mean just poor-quality, overpriced clothes sold in shopping malls bought by people with more money than sense. It is portrayed the pinnacle of casual affluence and resented by many for the same reason. Few recall its association with long-standing traditions, preferences, habits and standards. The term may die out but the concept will continue in the lives of our children. They unconsciously will make similar choices and follow familiar standards because that is the way it has always been done. My own children are completely clueless about what 'preppy' means and I am fine with that. Perhaps it's for the best that the term disappears from public consciousness so that our way of life is never again exploited and counterfeited. Well said! "The term may die out but the concept will continue in the lives of our children." Preppies existed long before the term was invented and will live on long after the term is extinct. Tribal groups like Preppies and the English Sloanes, or the idea of their lifestyles, have become aspirational, highly marketable and very highly profitable. With globalisation and the world feeling increasingly smaller, genuine members of these monocultures in their Harris Tweed jackets, passed down from their father, are hard to find among the masses of identikit wannabes in Chinese made shooting jackets, who try, but 'don't really get it'. The brilliant Peter York, author of The Official Sloane Ranger Handbook, is always worth digging out when it comes to this sort of thing. Growing up in rural New England we were not in the economic class that provided for a prep school experience but there were some that wished we could. Our answer was to dress and act the part. Finishing my college education in 1968 rather than joining the hippie life I began a “preppy” career as a banker. Now retired on the coast of Maine I stil like to wear a sport coat even when I am the only one in the crowd that does. I am thankful for this “preppy” blog that suggests that there are others out there that feel same even if in today’s more casual world we may be out of step with the majority. A view from England of course, but another great Peter York article from 2015 about the fall of the Sloane Rangers. 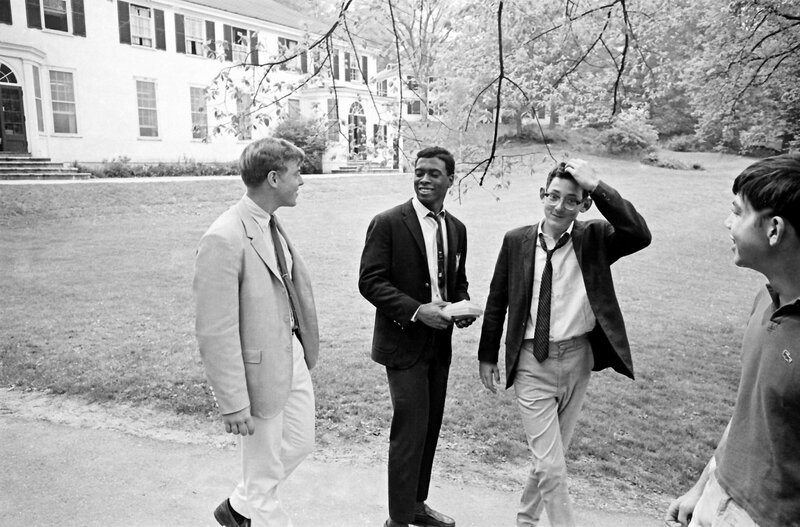 Before there was preppy, there was Ivy League, although the connotation is a little different. My mother-in-law's father was on the staff at a boy's boarding school in Virginia and was literally born at a prep school. But my father's mother-in-law was born in a log house in West Virginia. I have no idea why I read this blog. You and me both, BT, and I always especially enjoy what you write. My husband is the bonafied preppy, but we met on the west coast, where he literally came up and introduced himself to me because of the way I dressed and the car I drove. I shook his hand because I had noticed the way he dressed. Preppy dress was a signifier back then I believe it still has that value today. I once was so bold as to search out and introduce myself to a gentleman who turned out to be an actual preppie (even his son was attending a prep school at the time). The reason was, he had the same unusual car that I had at the time. A few years later he was the Best Man when I got married. The car, by the way, was a Rover 2000TC. I guess I realize why I read this blog after all. The photos are wonderful, too, especially the ones with Land-Rovers. Did you realize the Range Rover has been around since before I (finally) finished college in 1971? When i think of the term "preppy"...I think of khaki pants, Sperry Topsiders, Volvos, Tretorn tennis shoes, crew neck sweaters, Jeep Wagoneers, Golden Retrievers, bourbon and Coke, OCBD shirts, goose down vests, LL Bean boots...the list could go on and on. 'You look stupid and rich,' she said, removing her glasses. She was staring straight at me. Her eyes were brown. Okay, maybe I look rich, but I wouldn't let some 'Cliffie even one with pretty eyes - call me dumb. 'What the hell makes you so smart?' I asked. 'I wouldn't go for coffee with you,' she answered. I wish I had snapped a picture of a youngish man at Woodmans in Essex last summer. White shorts, no socks, Topsiders, and sun-reddened head were enough to tell his story. But he had inked a tattoo on his calf of a pastel yellow, pink and green argyle pattern. It was a sublime mix of decoration, identification, unapologetic pride, deliberate irony and humor. The real deal is a pleasure to see. Cheap Nantucket reds on hipsters at food truck festivals in SOWA not so much. But I would count both of those as current iterations of preppy. I view "preppy" as synonymous with American, practical, and sporty. The term was conceived as derisive by self-styled outsiders far more conscious of class than those it was directed against. Yes, it is identified with New England but that is because New England is the home country for so many Americans. And as for getting it "right" I believe that is a reaction to elements that would diminish those qualities noted above for profit. New England's emphasis on both private and public education was no doubt an instrument of projecting these qualities but I can't see a negative in that. Education is supposed to imbue the young with knowledge and the culture of their ancestors. Useful and appropriate dress is something worth learning. By the way, I intended to refer to Charles Gresham's examples as indications of American, practical, and sporty items. I think that the brands are the signifiers of a group of people who grew up with a certain amount of money, but learned from an early age to be modest and frugal. Education was valued, as was philanthropy (this last seeming to be lacking from many with new money). This group of people formed the backbone of the middle class and although the term refers to the United States, the trajectory of the middle class and its decline is a worldwide phenomenon (as was pointed out earlier regarding the Sloanes. Honor, integrity, modesty, frugality, education, duty formed the preppy ethos. The brands mentioned throughout the comments were steadfast in their appeal: they lasted a long time, didn't make one stand out from the crowd, and could work in most social situations, so that the wearer didn't have to fuss with multiple changes of clothes to go from one engagement to another. These days, the signifiers are probably slightly different: younger preppies are drawn to stewardship, environmentalism and public service and wear Patagonia, Prana and other brands who have worked hard to create clean production lines and reduce global pollution. These brands now have the "built to last" philosophy that is lacking in the old preppy brands like LL Bean, Ralph Lauren etc. This is so true, Suzanne. Important to provide that good example in our daily lives and to not disengage. "When we listen to the sea, we know what our moral imperatives are. Enrich the poor. Cure the Sick. Feed the Hungry. Clean the atmosphere. Restore the oceans. Live in balance with nature. Power the world sustainably. Stop fighting..."
I don't know about you but I've missed the incisive and warm comments of Bitsy on several of the recent topics. Growing up below the Mason-Dixon line, in the 60s, it meant Bass Weejuns (no black) or Florsheim Yumas... OCBDs from Troy Shirtmaker's Guild...Canterbury belts...a Corbin sack blazer... and Park Ave ties from L. Mayers & Sons...Oh, and a pair or two of Gold Cup socks for funerals. I am writing this in New England....Rhode Island on the was to Ireland....Prep still has its place. And always will have a following. Yes it is not as popular as it once was, but on the flight from Houston both males and females were dressed in a traditional what we'd call prep. All ages. To those of a certain mind set the term “Preppy” still means what it always did – an intelligent, thought-out way of best spending our time on earth. It’s all about a willed psychology manifesting itself in the outward trappings of beautiful, functional physical objects (clothing, etc. ), and also reflects the myriad aspects of what constitutes graceful, enjoyable living for one who thinks in this manner.